Suitable for Pike, Perch, Chub, Trout, Zander. 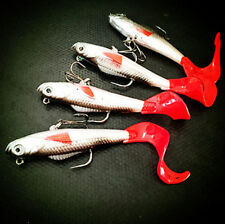 Predator Lures. The photos show the 5 lures you will receive. Lure size as shown in photos. Fish can’t resist the twitching action because it triggers their DNA. They bite whether they’re hungry or not! Twitches, Flashes & Buzzes in Water to Mimic Wounded Bait Fish. Hand-Painted Top-Quality Lure. 6" Multi-jointed 8-segement Pike Fishing Lure Swimbait Crankbait Hard Bait new. New for 2017. Perch Fry Bait ball Lure. Ideal for the hungry Fry Hunting Predators. Hook:#4 high carbon steel Treble hook. Easy to fish by barb hook. Swimming Depth: 2.7-4.5m. GBP 1.86 26 sold. GBP 0.99 13 sold. New Arrival! GBP 1.86 14 sold. GBP 1.29 24 sold. Weight: 14G. 1 x Fishing Lures. Swimming Depth : 0.3-0.9M. Material: ABS. Length: 8.5CM. Color: RANDOM Colors. Weight: 1/3 Oz. Color: as seen in the picture. Conical design to open the four claws to open the rubber band to facilitate hung bait. Very good fishing accessories. Material: Copper plastic. Our goal is. Color: As the picture show. Hook:#6 high carbon steel Treble hook. Material：Steel. DO NOT send without communication. 50 x Fishing Attractor Spinner Blades THE color is silver. For tackle craft and fishing lures. Lacquer coated for durability and shine. Color: Sliver, Golden. 1x Shrimp fishing baits. Length: 10CM. Hooks: Black hook strengthen upgrade. 2pcs Shrimp Soft Lure. Color: Random send. Beads Color:Luminous. Vivid fish shaped fishing lure, wonderful tool for fishing lovers. 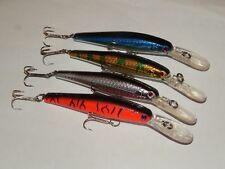 Item type: Electric Fishing Lures. 1 Fishing lure. Due to the light and screen differences,the item's color may be slightly different from the picture. Super attractive to all kinds of fishes, especially to the carp fish. 100 Pieces Soft Maggots Lure. - The best accessory in your fishing tackle box. Soft Grubs Lures. Hook:single hook. Service we provide. The fishing lures are created life-like swimming actions in water. Bright colors, easy to find fish in the water. Easy to use due to proper combination of wobbling and rolling. It is also easy to the freshman, so you do not need to worry about you are a freshman. Weight: 11g. 1pc Fishing Hooks. Machined craft shows better drag performance. 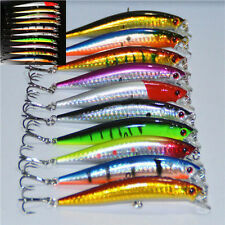 This fishing lures is smooth and rapid diving action. Be careful：The sharp hook is sharp. Due to the difference between different monitors, the picture may not reflect the actual color of the item.